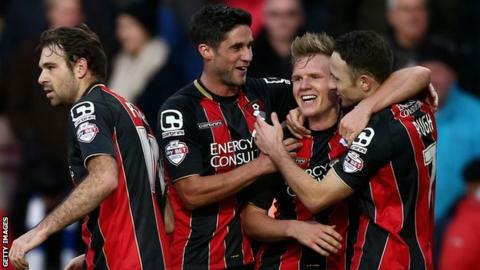 High-flying Bournemouth beat Cardiff in an eight-goal thriller to become the Championship's new leaders. Matt Ritchie put the hosts ahead after just 39 seconds as he side-footed home. Harry Arter's cool finish and Marc Pugh's curling shot either side of a Kenwyne Jones goal for Cardiff all came in the final few minutes of the half. Yann Kermorgant scored a superb free-kick for the hosts in between two Sean Morrison headers, before Callum Wilson rounded David Marshall to seal the win. The victory for Eddie Howe's men stretched their unbeaten run to 12 games and moved them ahead of Middlesbrough, who beat Derby in the day's early kick-off, at the summit because of their superior scoring record. The Cherries are the leading scorers in all four divisions with 44 goals in 21 league games. Bournemouth, who had opened the scoring in every one of their home games this season, did so again as Ritchie fired in his fourth goal of the season from the first attack. The game eventually settled down after the frantic start but burst back into life again with three goals in as many minutes just before the break. Arter doubled the Cherries advantage as he slotted the ball into the corner from the edge of the box, but the visitors soon reduced the deficit as Adam Le Fondre robbed Steve Cook after he slipped in possession and squared for Jones to fire home. However, Bournemouth restored their two-goal lead within a minute as Pugh curled a sublime shot into the top corner to make it 3-1. Russell Slade's visitors made the perfect start to the second half as centre-back Morrison rose above a static defence to nod Peter Whittingham's cross past Artur Boruc, before referee James Adcock was involved in a moment of controversy when he failed to punish Cardiff goalkeeper Marshall, who looked to have handled the ball outside the box. A moment of brilliance from substitute Kermorgant stretched Bournemouth's lead, the Frenchman placing a precise free-kick into the top corner after Pugh had been fouled. Whittingham and Morrison combined again for Cardiff to make it 4-3, but after Bournemouth had let a two-goal lead slip in their last home game against Millwall, Wilson made sure there was to be no repeat as he raced onto Ritchie's through ball and calmly slotted home. Bournemouth assistant manager Jason Tindall: "For us to be top of the Championship before Christmas is a great achievement and our aim now is to build on that and extend our lead at the top. "I'm not sure we really anticipated winning it 5-3 but we will take it because top is the position we want to be in. Cardiff threw everything at us and there were goals flying in everywhere. We pride ourselves on attacking football but maybe that was the reason we conceded some poor goals today. "But the fact that we are top and all five goals were scored by different players shows just how good this squad can be." Cardiff manager Russell Slade: "What I was most disappointed with was the start because we were losing within a minute away from home which is a disaster. "But what is worse is that we do it at the home of the league leaders. It feels like we kept shooting ourselves in the foot throughout the game. Every time we threatened to make a game of it we shot ourselves in the foot again." Match ends, Bournemouth 5, Cardiff City 3. Second Half ends, Bournemouth 5, Cardiff City 3. Attempt missed. Peter Whittingham (Cardiff City) left footed shot from outside the box is high and wide to the left. Attempt saved. Marc Pugh (Bournemouth) right footed shot from the left side of the box is saved in the centre of the goal. Assisted by Yann Kermorgant. Offside, Bournemouth. Simon Francis tries a through ball, but Yann Kermorgant is caught offside. Attempt missed. Charlie Daniels (Bournemouth) left footed shot from the left side of the box misses to the right. Assisted by Andrew Surman. Goal! Bournemouth 5, Cardiff City 3. Callum Wilson (Bournemouth) right footed shot from the centre of the box to the centre of the goal. Assisted by Matt Ritchie with a through ball. Attempt missed. Tom Adeyemi (Cardiff City) right footed shot from the centre of the box is too high. Assisted by Ben Turner with a headed pass following a corner. Corner, Cardiff City. Conceded by Andrew Surman. Foul by Adam Le Fondre (Cardiff City). Corner, Cardiff City. Conceded by Charlie Daniels. Attempt missed. Yann Kermorgant (Bournemouth) header from the centre of the box misses to the left. Assisted by Simon Francis with a cross. Attempt blocked. Kadeem Harris (Cardiff City) right footed shot from the centre of the box is blocked. Assisted by Ben Turner. Attempt missed. Marc Pugh (Bournemouth) right footed shot from outside the box is high and wide to the right. Assisted by Matt Ritchie. Offside, Bournemouth. Harry Arter tries a through ball, but Matt Ritchie is caught offside. Attempt saved. Harry Arter (Bournemouth) right footed shot from outside the box is saved in the centre of the goal. Assisted by Steve Cook. Goal! Bournemouth 4, Cardiff City 3. Sean Morrison (Cardiff City) header from the centre of the box to the bottom right corner. Assisted by Peter Whittingham with a cross following a corner. Attempt blocked. Peter Whittingham (Cardiff City) left footed shot from outside the box is blocked. Attempt blocked. Adam Le Fondre (Cardiff City) right footed shot from the centre of the box is blocked. Assisted by Craig Noone. Attempt missed. Craig Noone (Cardiff City) left footed shot from outside the box is high and wide to the left. Assisted by Aron Gunnarsson. Attempt saved. Yann Kermorgant (Bournemouth) right footed shot from the centre of the box is saved in the centre of the goal. Assisted by Matt Ritchie with a cross.